Our "Make Your Own" Holiday Wreath Studio is open! 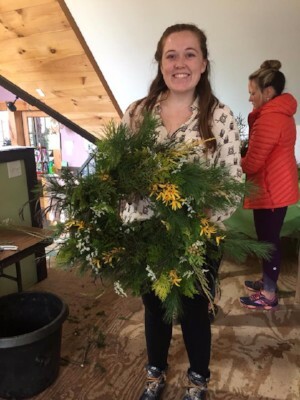 Here's how a unique, custom, DIY holiday wreath comes together in one of our workshops. First you pick out a mix of greens for fragrance and texture. Then you choose from an assortment of dried flowers and decorative items. We help you create bundles--according to the size of your wreath. We have several wreath machines in the studio, and by stepping on a pedal, the machine pinches the wire wreath frame around your bundles holding them tightly in place. You alternate the bunches of greens with the decorative bundles creating a lovely, long-lasting holiday wreath! Our "Make Your Own" Holiday Wreath Studio is open! Call or stop by to make an appointment. We have had groups come, mothers and daughters come together, friends meet and make their holiday wreaths together. It is such a fun way to spend some quality crafting time together. Plus, we provide everything you need (and clean up the mess!) and you leave with a one-of-a-kind holiday wreath. You can also make your appointment by calling (845)-658-9007.